Polenov was famous among other artists for the fact that in his landscapes he was better than others to convey this or that mood. An example of such a picture is his work “Grandmother’s Garden”, which unites the landscape with the genre scene. The canvas presents a noble nest of the XIX century. Most of the canvas was taken by the image of a wild thick garden. In the background is an old neglected mansion. The house itself, although wooden, is decorated with a portico, columns, pediment and stucco. It was a typical technique in the noble architecture of the time: houses were built of wood, and plaster was applied on top of it for representativeness, creating the appearance of masonry. But the old plaster on the house was already peeling off noticeably, opening old logs to our eyes, the cornice had rusted, the stucco molding, the columns and steps also lost their former glory. But once on these steps, children’s feet ran and the floors of dresses of young beauties rustled, hurrying to the balls. 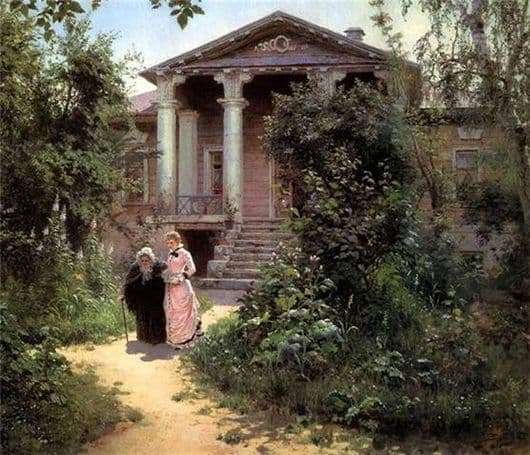 In the foreground of the picture we see an old woman – the owner of the mansion, and her granddaughter. They are slowly walking along the sandy path filled with the sun along an abandoned overgrown garden – the silent witness of the young years of their mistress. The grandmother is dressed in an old-fashioned dark-brown dress and a white cap, and on the girl a beautiful pale pink dress is what it was in the then fashion. The clothes and posture of women serve as a kind of opposition to the old and the new, which, in essence, is the main motive of the picture. An elderly lady seems as decrepit as her home. Relentless running of time does not spare anyone. Before our eyes the whole epoch and its culture go into non-existence. However, such reflections that arise when looking at the picture, do not generate feelings of sadness. Rather, the mood that creates this work Polenova, can be described as nostalgia or bright sadness. The old is dying of its age, but it is replaced by the new and it gives hope to the heart. The palette of colors used by the artist is very diverse. These are the lush greenery of the garden, the bright yellowness of the path, and the colors of the heroines’ paintings contrasting with each other. But all this range of colors coexists on the canvas very harmoniously.